Whether you’re cooking for a family or just for one, making a fast lunch before school pick up or spending hours preparing a dinner party, one thing is certain: If your food looks pretty you’ll be more likely to savour the food and consequently eat less – an advantage on both your digestive system and your weight. Here are two simple, fun ideas for healthy snacks for adults or children. I sliced a small watermelon and then left my daughters (aged 9 & 12) alone with some cookie cutters and a camera! This was one of their beautiful creations. Watermelon shapes are a fun way to include your children in both the preparation of food and the importance of healthy nutrition. 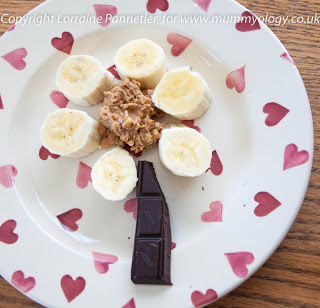 This is an ideal breakfast dish (alongside some oats or wholemeal toast to provide energy for a few hours) or an after school snack, perhaps accompanied by nuts and seeds or some homemade oat bars. This is a delicious mixture of vitamin-rich banana, antioxidant-rich dark chocolate and protein-rich peanut butter – making a perfect mid-afternoon snack for mums and older children. Use this design as a template and get your little ones arranging cucumber or carrot circles and strips into pretty flower or sunshine shapes with a dessertspoon of hummus in the middle. 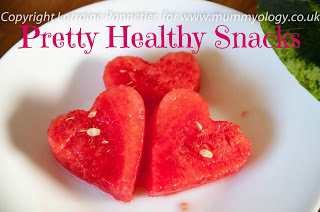 Keep it simple, keep it healthy and keep it looking pretty at every meal and snack! We love to play with our food like this! Great post.